My relationship-story-dance with Jeff has been full of uncertain futures and unknown outcomes. It’s certainly been a case of love in the moment. Finding the balance between that and commitment though, to carry through moments of fear and uncertainty, is quite tricky. For the last few months on the first day of my bleeding, I have used that as a marker point to decide if I want to continue and commit to what we are doing for another cycle and tgen use the blood to bind. The first time I did this it came from my deep submission and offering of myself to a true master…since then Jeff has owned some of his shadow and his capacity in that sense has dramatically developed, as has his capacity to influence my energy and essence…and to be respected by me. I have a growing full trust in him like I’ve never felt before, along with a yearning sense to belong. It’s scary and exciting and beautiful. The next bleed came with intense magic and art and fierceness and I decided to claim and to enjoy our love in whatever shape it took. He left before the following cycle started, however Mark was around and we did some powerful magic between the Queen and the Warrior of baphomet. Mark witnessed me claiming that dark full love magic in a potent way, and I saw his determination and fear for his ritual to come. I’ve enjoyed feeling my growing queen-energy this month and having it witnessed by others too. 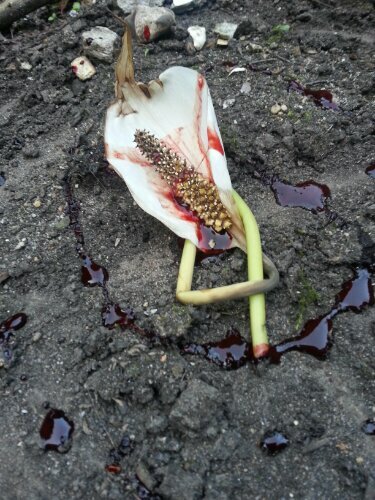 Now my bleeding comes again, I think this may have been the first full cycle that my man has been absent, that I have not felt his touch or his kiss, since we met. Although we took a couple of days to talk and reconnect a bit in these weeks of “silence”, we have had some full time apart and let the whole of our old pattern to fall away to make space for something new to grow in the summer when he arrives. I thought that I would start bleeding tomorrow, when I’d have a chance to connect with Jeff and perhaps do some magic together with the blood. But it came a day early, on a day that’s important for him to focus on his daughter who is having a birthday, and on grief, and on his own death-as-approval-man and the full implications of what that means. So instead I’m doing something else. I am typing this in the garden, sharing myself with life and nature. 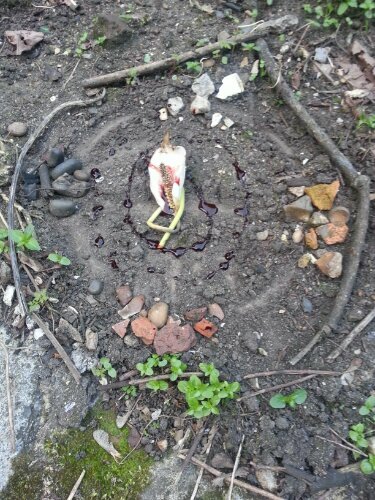 I saw a vortex on the ground and I’ve created art-magic around it – using stones and shells and pottery and other items I found around. It is based on a medicine-wheel, with colours for the directions, and in the centre I have put the first peace-lily flower from inside, that has started to brown and die, it looks caught between life and death. I will pour my blood into the vortex-art-magic, and this month shall be not about claiming just the love-relationship, nor even stepping into the Queen, but surrendering ALL into lifes-magic, honouring-renewing a vow I made almost 10 years ago to give myself to Life in service and in love. The difference now is I understand and see myself as part of this life and nature, and I approach her and myself with deeper care and love than ever before. I will for this next cycle, which carries me through the summer solstice, make commitment to life, this view of my self as part of life, to plant the seeds of life-death-rebirth magic and art. To be THIS woman who can enjoy her own company, who can hold all, and in this full connection I will embrace and welcome and cherish my man. In HIS full truth, pain, brokenness, hope, vision, ALL of it, all of him, all of life and friends and loves and tribe. my weakness and fear, but carry her forward with me into the world and life I’m ready to birth. I want to create a life with love in the centre.